Imagine a service where podcast listeners can select five-minute highlights from podcasts. I would very much subscribe to people’s highlight clips. 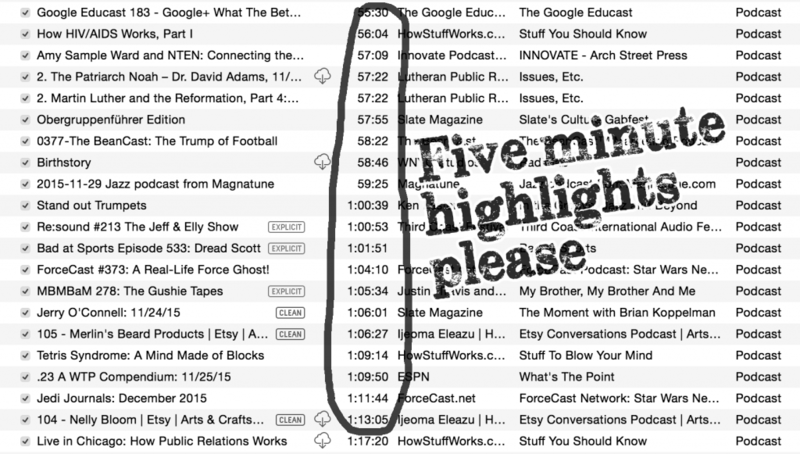 In most cases sixty minutes in one podcast episode is way too long. Lots of chatter, but what are the best parts? Podcasts that are 10 minutes long are my sweet spot. Focused. To the point. Soundcloud gets rather close to this dream, because listeners can post comments at specific points in the podcast. Several comments in one area means that spot is good listening. However, to find these sweet spots would require a good amount of clicking around. If these hotspots in podcasts could be automatically extracted into a soundcloud playlist, that would be very handy. The newspaper publishing is going through an overhaul as editors are discovering that the future of news is not an article.